Some days back I got a message on Facebook chat, “Do you remember me, Chechi? I am So-and-so from way back when we were school going kids, and neighbors,” or something of the sort. You can imagine my joy-filled surprise when I tell you that my reply to him was all in uppercase. Oh, the horror of someone who is a stickler for doing things the right way on looking up and seeing her message shouting back at her! It was of course the excitement of the sudden discovery. But I know he must have understood that as well without my telling him for it is not everyday that you get in contact with someone you knew once upon a time, more than four decades back. See that picture above, the girl holding a baby, no, not the short one, but the tallest among the lot? Yes, that’s me in 1971. I think this will be one of those rare occasions when I ‘make hay while the sun shines’ and lay claim to the use of the word ‘tall’ in relation to myself. After all, the rest of them are much younger to me and had not yet reached their full potential in height at the time. Not so now, having left me far behind, they now inhabit higher planes without exception. 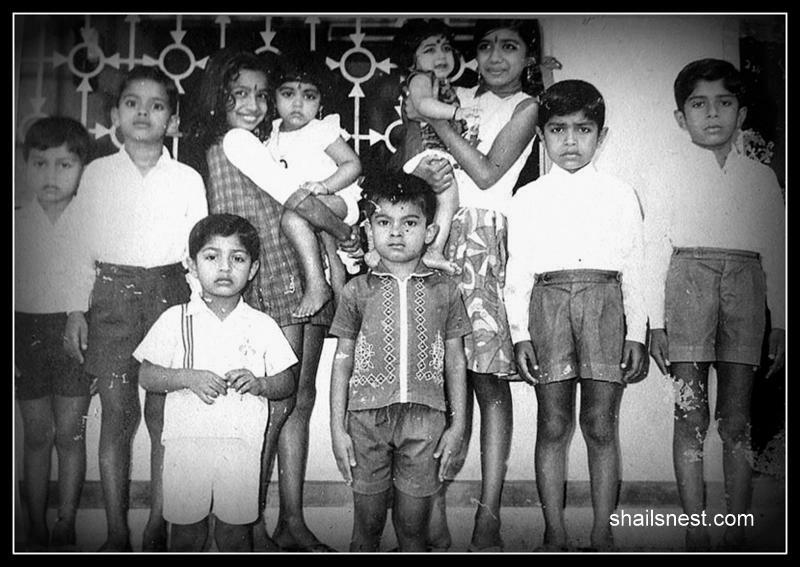 Anyways, that motley crowd you see were the bunch of kids (there were a couple more of them) that stayed in the rented houses in a property called ‘Mannam Quarters’ in Alleppey in the early 70s. The one to my left with the appearance of being displeased with things in general is who contacted me. Next to him is his older brother and the younger one being the one in white in the front row. My siblings (sister and brother to my right) and I stayed right next door to them and we are supposed to have had a gala time. Being much older to them (Ahem, I was all of 12! ), I was not really speaking, in their league. Yet, as the stories unfolded once we were all connected, in person and through emails, I gathered that I did ‘lead’ them in some activities in the past. Through their excited chatter those which I had a somewhat sketchy memory of were made more clear, and some forgotten ones were pushed to the fore, but yet others stubbornly refused to return. The vegetable garden, the dog, the cats, the group-singing, the children’s group, the water pump, the name of the laborer who worked the area, the mulberry tree, the school, school bus, the movie by the name Poombatta and the fact that I recommended it to their parents. Huh, me? Really? What amazes me is how people cannot stop talking of their childhood. Everybody seems to have wonderful memories of that long gone period of their lives. I wonder where mine have hidden themselves. Perhaps there is some truth in what I read the other day, that painful memories leave a deeper and darker mark/impression on our psyche than the happier ones. May be that is why looking back is not an option my brain wants me to have. I always read your posts but seldom comment Shail but your smile lured me today. Love the pic and your writing is as always heartwarming. 🙂 It is a pleasure. “….painful memories leave a deeper and darker mark/impression on our psyche than the happier ones” True. ‘m sorry you had a tough childhood (it sounds like it). I think many of us had negative instances, however I don’t feel that it would necessary to bring up the memorable moments and memories of your childhood. So forget the bad parts (may be hard to do so) and always think of the good ! Btw, I love looking at pics from your childhood. Saw that you posted one of you playing the veena or something. (I know I left a comment, forgot which post that was errrr ! ), but you were so cute !! Love learning about peoples’ childhoods !! Its such a wonderful experience to make a connect now with childhood friends !! Thank God for social networking !